At the end of last week European currency had reached the local highs against the USD. The pair received strong support from both Mario Draghi, the head of European Central Bank, and from Investors. Chairman of ECB said that economic growth rate in Eurozone has significantly increased and the regulator raised the forecast of GDP growth this year up to 1.2%. By 2016 GDP is expected to grow up to 1.8%. He also noted that situation in the currency markets of Europe is stabilizing and there are no reasons to curtail program of securities purchase. All these facts had a positive effect on Euro rate; demand among investors helped the pair grow to the key resistance level of 1.3900. Attention today shall be also paid to investor confidence index in Eurozone and EU economic summit. Support levels: 1.3820, 1.3800, 1.3770, 1.3700 and 1.3630. 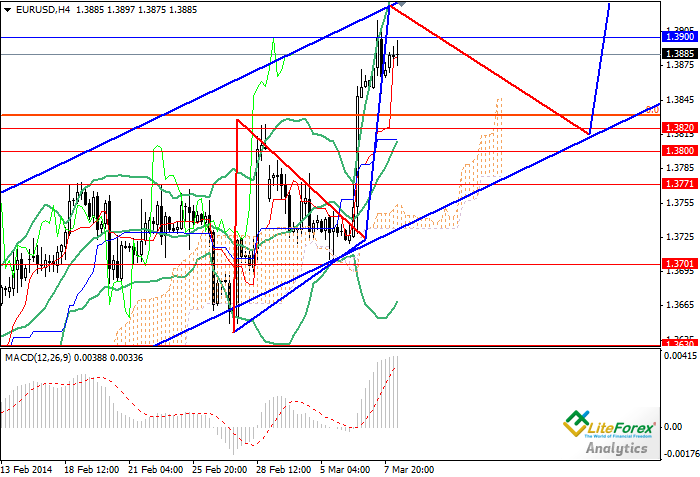 Resistance levels: 1.3900, 1.4000 and 1.4120. In the current situation it is recommended to place pending orders to buy from support levels of 1.3800 and 1.3820 with profit taking at the level of 1.4000.